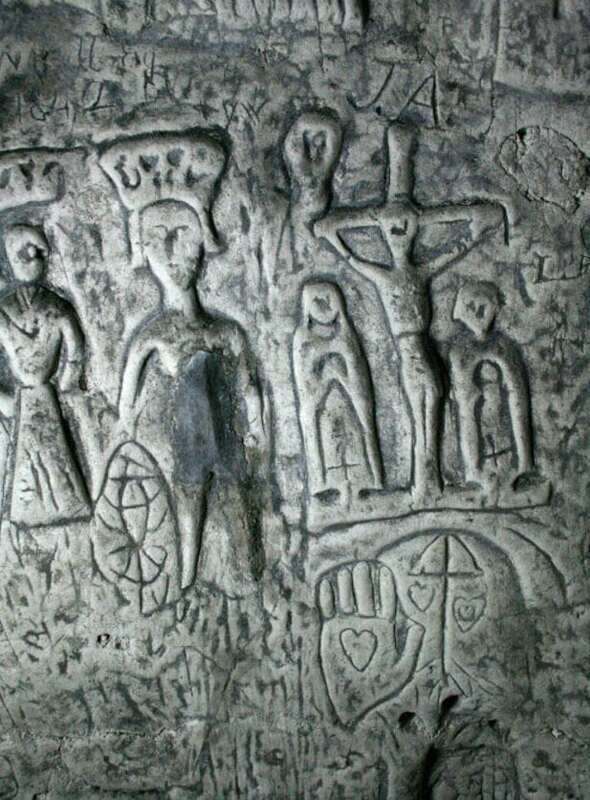 A series of stunning medieval carvings believed to have been created by the Knights Templar are proving a hit to tourists deep underneath a bustling town centre. 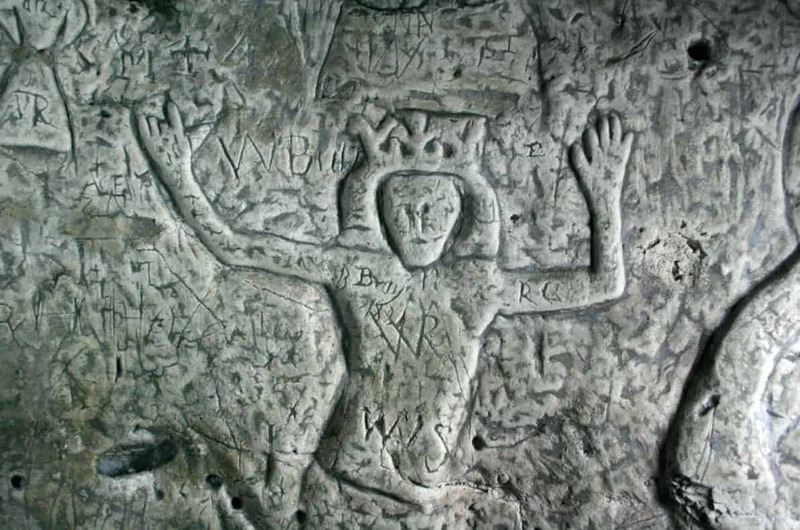 The 800-year-old images were carved into the chalks walls of a deep cave beneath Royston, Herts. Historians believe they depict scenes of the Knights Templar – a band of fighting Christian monks who defended pilgrims to the Holy Land in 12th and 13th centuries. The ancient Royston Cave is known to have been used by the Knights who also fought in the Crusades. There has been renewed interest in the secret organisation following the Dan Brown book The Da Vinci Code – which speculates that they may have found and hidden the Holy Grail somewhere in the UK. This cave, which lies under the junction of a Roman Road in Royston, Herts., comprises of cylindrical lower and bell-shaped upper parts totalling 17ft diameter and 25.5ft in height. Their ornate images, found inside the ancient monument, were captured by photographer Keith Jones. One image of the carvings show two figures close together near a damaged section – all that remains of a Templar symbol showing two knights riding a horse. 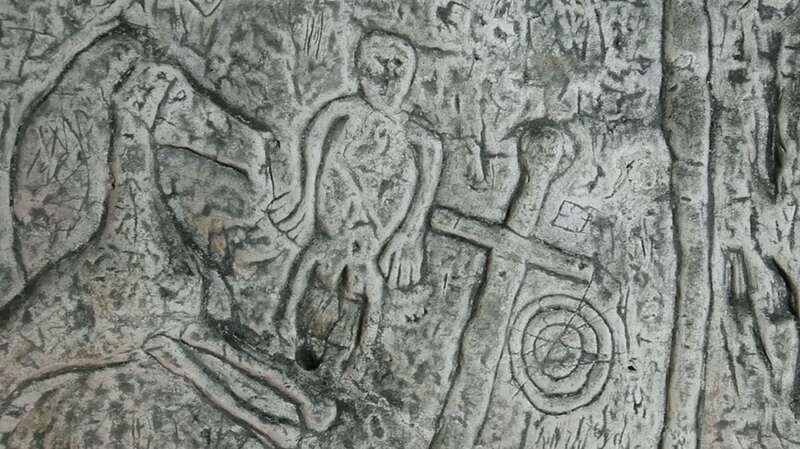 Other carvings show calvary scenes with Mary, the mother of Jesus, and John The Baptist – as well as a group believed to show the Holy Family – but uncertainty surrounds the remaining figures. The official website for the cave says that the large panel on the left of St. Christopher “represents the Holy Sepulchre having a damaged figure of Christ awaiting the resurrection above the large niche on the left”. It continues: “Mary Magdalene, or an angel on the right-hand side sits on the stone rolled away from the entrance. “The dove and the hand above may represent the Holy Spirit. The niche below probably held a lamp. “The long row of figures below includes both men and women and although none can be identified those marked with crosses are possibly saints and those with hearts may be martyrs. “The two small figures below St. Katherine may be (although this is by no means certain) Richard I (Lion Heart) and his Queen Berengaria whose crown is shown floating above her head as she was never actually crowned Queen. Some believe the cave’s shape is modelled on the Church of the Holy Sepulchre in Jerusalem. It was discovered by accident in 1742 by workmen who removed a millstone to find a well-like shaft down into a dark cavern – about 2ft (60cm) diameter and 16ft (4.8m) deep. Toeholds had been cut into the chalk to form rudimentary steps – and records say a small boy was “volunteered” to make the first descent. The domed ceiling, which is now bricked and grilled, was complete and partly tiled – and lay just a foot below the surface of the road. They also found what is now named the East Shaft which is believed to have been a chimney or air vent. Investigators found some decayed bones and a skull, fragments of a small drinking cup and a small unmarked piece of brass. No real buried treasure was discovered hidden except for the carvings in the lower part of the chamber. Early visitors came down the original ‘North entrance’ with the help of ladders until a new entry point was built in 1790 by bricklayer Thomas Watson. He cut a 72ft (22m) long tunnel into the cave wall and charged six pence for each visit. The Cave was Grad 1 listed by English Heritage in 1964 and leased from the then owners by Royston Town Council who installed the railings and lighting. The whole surface of the lower part of the cave is covered with names cut by visitors – but steps have been taken in recent years to prevent people touching the carvings. Next PostIs Woolworths set to return to UK high streets?